This blog uses affiliate links. By purchasing something after clicking one of these links, I may receive a small commission. For more information: See disclosure policy. Thank you for helping support my family. Disclosure: product provided by PEEPS & COMPANY® for editorial consideration. Can you believe Easter is almost here? I’ve teamed up with the folks at PEEPS & COMPANY® to share with you some last minute dessert and gift giving ideas for Easter. First, let’s start with dessert. When it comes time to gather together as a family to celebrate Easter one of my favorite traditions is indulging in a sweet treat. 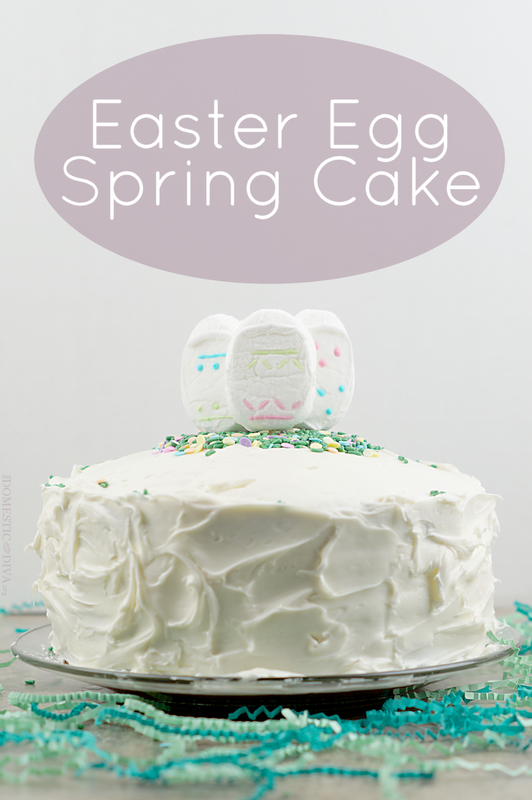 Below I’ll share with you how easy it is to create a Spring Cake perfect for your Easter table using PEEPS® decorated marshmallow eggs. Bake one box of white cake mix according to package directions in 2 9 inch round pans. Set aside to cool. While the first batch of cakes are cooling, prepare the second box of white cake mix according to the package direction except add 8 drops of blue liquid food coloring and 12 drops of red liquid food coloring to the batter before separating into two 9 inch round pans. Bake according to the package instructions. Cool completely. Once the 4 cake rounds are completely cool, cut off the top of the round cakes so that it is level. Place a purple cake round onto your cake plate and ice with half of a can of white frosting. Place a white cake round on top and ice with the remaining white frosting. Continue layering purple and white cake rounds using the remaining cans of white frosting to ice the entire cake. Once the cake has been iced, apply easter themed sprinkles to the center of the top of the cake. Poke cooking skewers through 4 of the PEEPS® Decorated Marshmallow Eggs and place into the center of the cake (trim the skewer from the opposite end if too long). Serve & Enjoy! Happy Easter!!! While I was shopping for the PEEPS® Decorated Marshmallow Eggs for the top of my Easter Egg Spring Cake, I came across the PEEPS® Mystery Flavors. I’m so excited that they brought these back this year as my boys love trying to figure out what the different flavors are. There are 3 mystery flavors this year. Can you guess what the flavors are? Of course, PEEPS & COMPANY® is more than just delicious marshmallow treats to enjoy during the holidays. At peepsandcompany.com you can snag all kinds of PEEPS® themed goodies to fill the basket of your favorite PEEPS fan. You will find many great gift ideas from PEEPS® BFF Heart shaped pillows, PEEPS® adult BFF slippers, PEEPS® spring shaggy pillow, PEEPS® socks, and even an adorable Chillin’ with my PEEPS® Teddy Bear. Head on over to peepsandcompany.com to check out all of the awesome gift ideas they have to offer. Also, PEEPS & COMPANY® was nice enough to share a discount code that you can use to get 20% off your next purchase (no minimum required) until April 15, 2016. Just input the discount code: EASTERTREATS at checkout. How do you you use PEEPS during the Holidays? Disclosure: The lovely folks at PEEPS & COMPANY® provided me with information and a gift pack of PEEPS & COMPANY® products to check out for myself. As always opinions are my own. My experience may differ from your own. Heather is a homeschooling mom of two boys currently living in central Georgia. She has been sharing her domestic story online as a lifestyle blogger for 15 years. Through her blog and social media platforms, Heather provides a glimpse into domestic life as she shares with other stay-at-home moms how she tackles modern homemaking and the challenges of raising a family.